As it happens, these last two installments of our countdown are largely going to be monopolized by Mighty Morphin Power Rangers #29 and #30 respectively. Naturally, Kyle Higgins, Daniele Di Nicuolo, and the crew at BOOM! Studios have ramped things up as we move toward this week’s finale. You’ll see that here, as four spots are occupied by moments from issue #29. Power Rangers Lightspeed Rescue is a perennially underrated season, in my opinion. Sadly, that point is accentuated by the fact that Lightspeed is fairly underrepresented in Shattered Grid. Not as bad as, say, Operation Overdrive. But still. However, we do get a few appearances from Carter, the Red Lightspeed Ranger. And issue #29 does start with an appearance from Kelsey, the Yellow Lightspeed Ranger. Oddly enough, she’s in a push-up contest with TJ. Mind you, her hair is the wrong color. But I’m just grateful she made the cut! 17. Andros, Karone, Zordon, and Kruger. 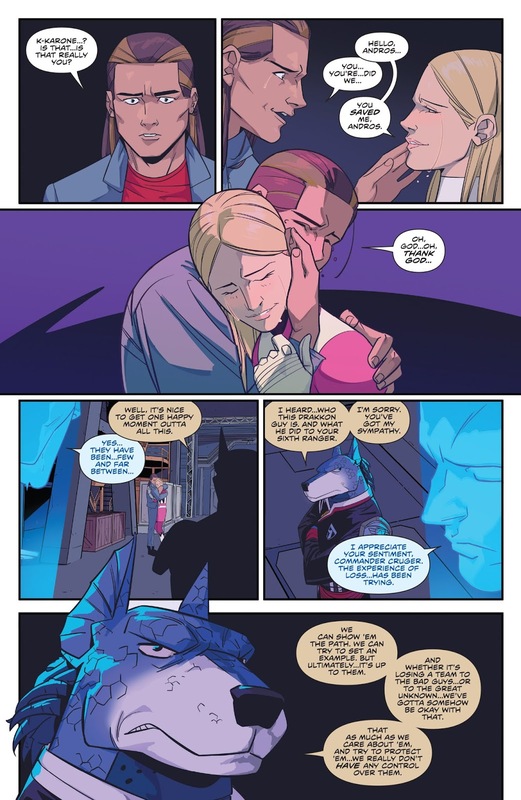 One thing I’ve complained about as it relates to the main MMPR comic, is how characters are learning too many things about their future. The appearance of Saba, the Thunderzords, etc. But of course, I threw my hands up once we got to Shattered Grid, and simply opted to enjoy the story. So this little moment with Andros and Karone managed to be a highlight for me. The story obviously isn’t about them specifically. But this relationship is an important one in the annals of Power Rangers history. So to see it get spotlighted like this is pretty cool. Zordon and Kruger also get a little scene on the same page. I wouldn’t have mentioned it, were it not right after this Andros/Karone exchange. But it’s cool in its own right. Promethea is Terra Venture, the space colony that serves as the setting for Power Rangers Lost Galaxy. I mean, c’mon! How damn cool is that? They didn’t have to go there. But they did. And I love ’em for it! This is a beautiful moment. Conceptually, artistically, or virtually any way you want to look at it. Holy crap, that’s gorgeous. The splash page on the right even has a Kevin Maguire, Justice League International feel to it. 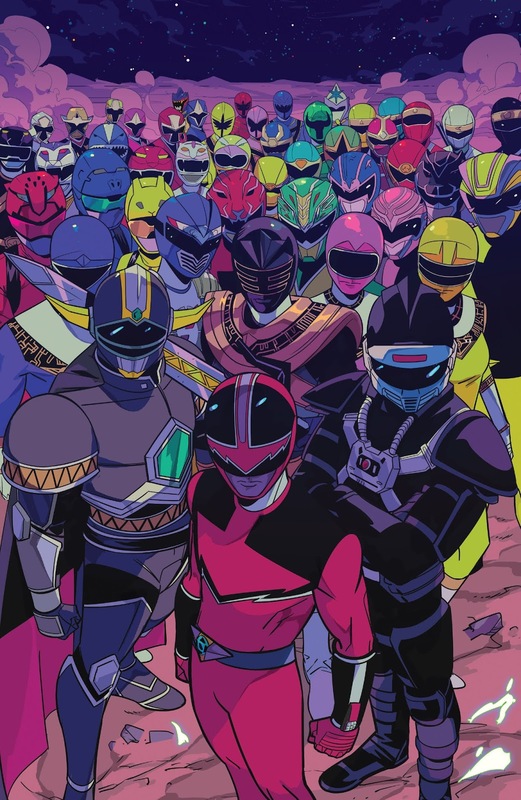 While I highly doubt this was intentional, I appreciate that Daniele Di Nicuolo put the Quantum Ranger at the front of the pack. Jason, Kimberly, and the others are seeing the future here, after all. Also, note the appearance of the Rangers from the upcoming Power Rangers Beast Morphers. Up to this point, Go Go Power Rangers had been Tommy-free. Present-day Tommy, at least. That ultimately works to the book’s advantage. The Green Ranger isn’t hogging the spotlight, and we get to focus more on our five heroes. However, the series makes an exception in issue #12, when Ranger Slayer tracks Tommy down. She shoots him with a super-powered arrow. 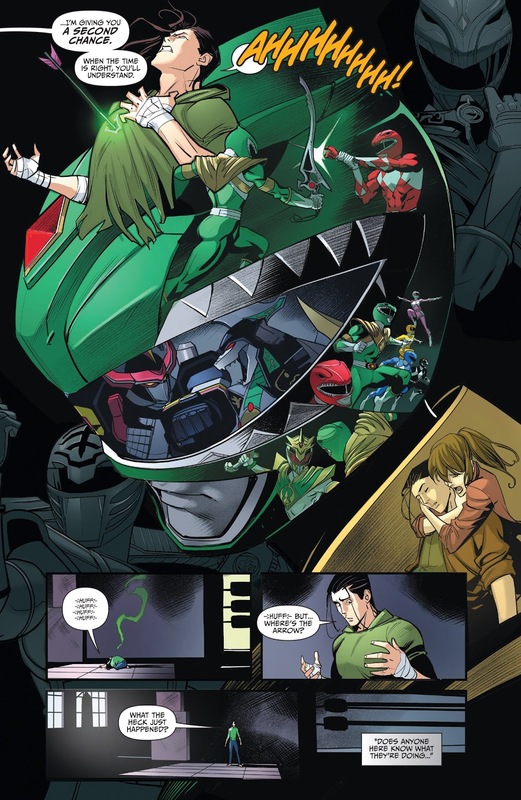 The future Green Ranger is hurt, but not killed. Kimberly says she’s giving him a second chance. I suspect we’ll find out what she meant in the finale. Follow Primary Ignition on Twitter, or at Facebook.com/PrimaryIgnition. This entry was posted in Comic Books/Graphic Novels and tagged Andros, Anubis "Doggie" Kruger, BOOM! 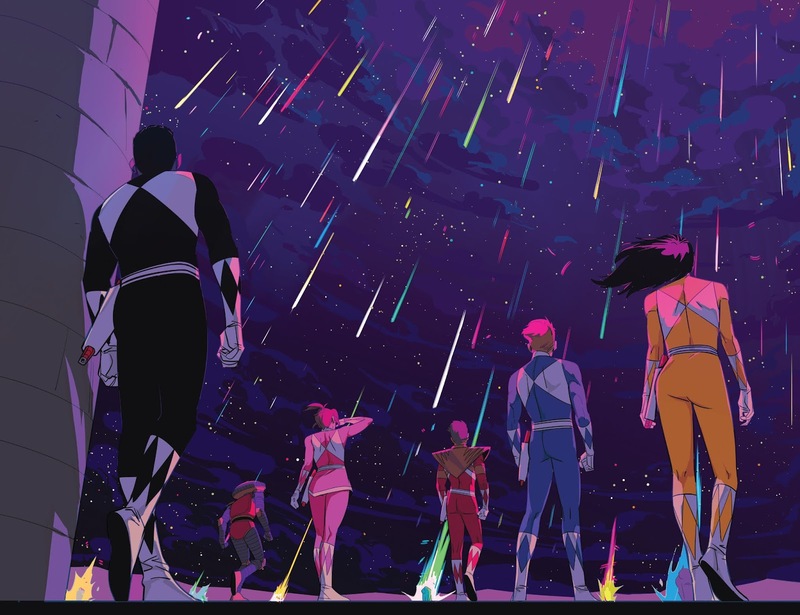 Studios, comic books, Dan Mora, Daniele Di Nicuolo, event comics, Go Go Power Rangers, Go Go Power Rangers #12 (2018), Go Go Power Rangers (BOOM! 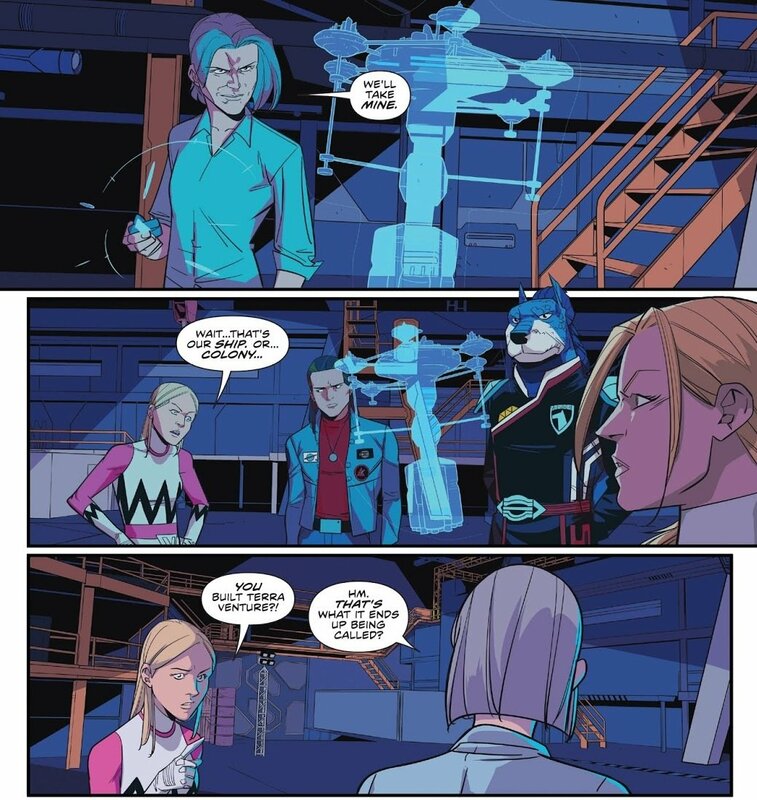 Studios), Grace Sterling, Green Ranger, Karone, Kelsey Winslow, Kyle Higgins, Magna Defender, Mighty Morphin Power Rangers, Mighty Morphin Power Rangers #29 (2018), Mighty Morphin Power Rangers (BOOM! Studios), Mighty Morphin Power Rangers: Shattered Grid, Phantom Ranger, Power Rangers, Power Rangers Beast Morphers, Power Rangers in Space, Power Rangers Lightspeed Rescue, Power Rangers Lost Galaxy, Quantum Ranger, Red Ranger, Rob Siebert, Shattered Grid, Terra Venture, TJ Johnson, Zordon on 08/27/2018 by primaryignition.